Discover how the ProAdjuster™ can help relieve your pain! Our office is the only one in the area that offers the ProAdjuster™. This technique is good for both young and old. Geriatric patients, osteoporotic patients, those in severe pain, and post-surgical patients all have great success with this specific, instrument-based adjustment. There is no pain involved and it is comfortable, scientific and safe. The ProAdjuster™ is a comfortable approach to spinal correction. 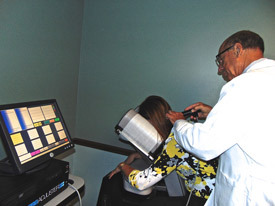 We’ll measure your spine’s ability to function properly with this computerized instrument. It looks for a lack of motion where vertebral subluxations exist. The computer is a motion-detection device, so when the subluxation has been reduced, the computer automatically shuts off. There is no risk of over treating and no discomfort is involved.